Yee Ha….I’m back, and determined to make my 365 Stampin’ UP! Projects in 365 days. I am so excited that almost every time I check my hit calculator the number increases… People out there are already checking me out!! Knowing people are watching will definitely keep me working towards this crazy goal of mine! If any of you out there are within a 2 hour drive I sure could use a few more workshop bookings, and I would love to finally meet some people in the area that are either already in LOVE with paper crafting or are interested in checking it out. I always provide free make & take projects at my workshop, so get a few people together and we can have a great evening of STAMPING!! Just shoot me an email at betty.ray020@gmail.com and we will set it up…I can usually put things together on short notice as well. I had actually stamped these images a couple of days ago, but was having a hard time finding layouts for them. In the end I settled for something simple and sweet. 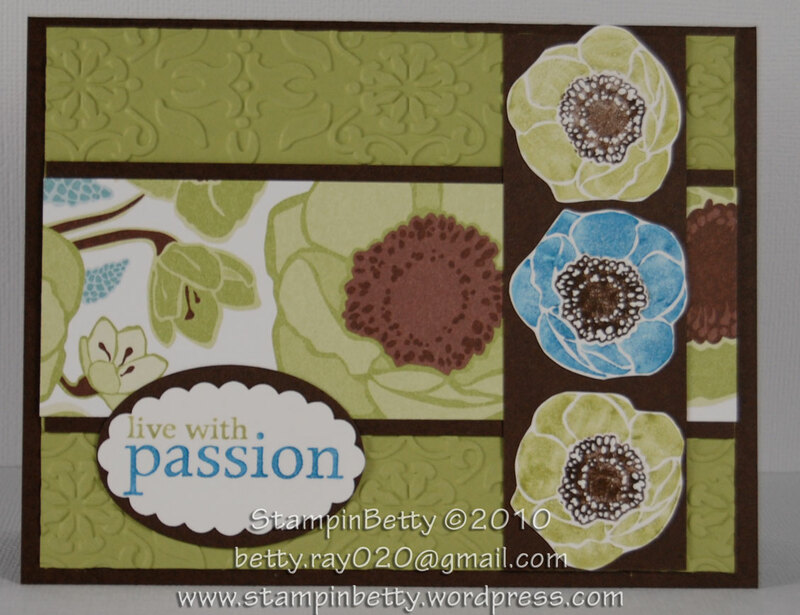 I just love these textured Specialty Designer Series Papers Stampin’ UP! has started using. Granted….in the photos you can’t appreciate it as much but in person they are really something. They are so thick and the texture gives them that little extra touch of richness that such a simple project needs. These papers remind me of old school wall paper patterns which I just LOVE…..well…let me clarify what I mean by love. I HATE, HATE, HATE wallpaper, can’t stand it, and just the thought of it brings up very angry feelings 🙂 I don’t think I can express the feelings of distaste strong enough. I have vowed to never ever give a second thought to buying a house with wallpaper in it, even in the tiniest of doses. This is stems back to a traumatic wallpaper removal experience I had a few months ago with a kitchen full of 1980’s blah (not retro-cool) wallpaper. Yep, I can be a bit of a Drama Queen… I think it was the biggest nightmare of all the do-it-yourself ideas I have ever had, and believe me, I have all kinds of wonderfully fantastic home improvement ideas. Of course many of them don’t quite turn out like the beautiful pictures in my head (my poor, poor husband who puts up with these whims…). I knew that the project would not be as easy as it looked or as easy as the “Home Network” makes it seem in all their lovely home remodeling programs, but GEE, really??? It took an entire week to just get the stuff down, and I must have taken some of my frustrations out on the wall itself, because there was much wall repair needed after the paper and glue came down. Those walls should have just been thanking me they weren’t getting the wrath of the evil PMS monster…LOL! The second card (the one on the right) so reminds me of the old suitcases with hard sides and the leather or metal on the corners… I thought these were so cute and reminiscent of days gone by. As always click HERE to shop for all the Stampin’ UP! supplies used to create this project or many others. To simplify things for you the link is set to open in a new window, and I provide the item numbers below. So all you have to do is put the item number in the search field (on right side of Stampin’ UP! screen) and your shopping is just that easy. Plus your purchases help support my quest to complete 365 Stampin’ UP! projects in one year and blog about every one of them. 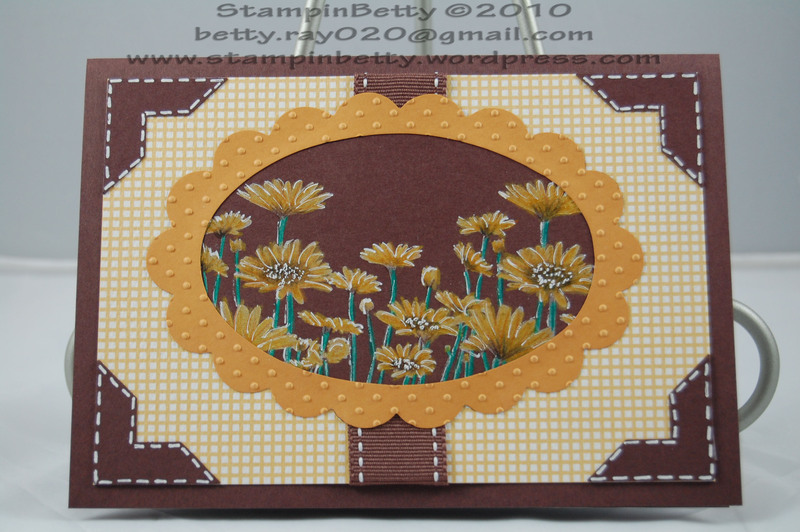 The only item in this project not listed in the previous one is the Upsy Daisy Stamp Set (111710). 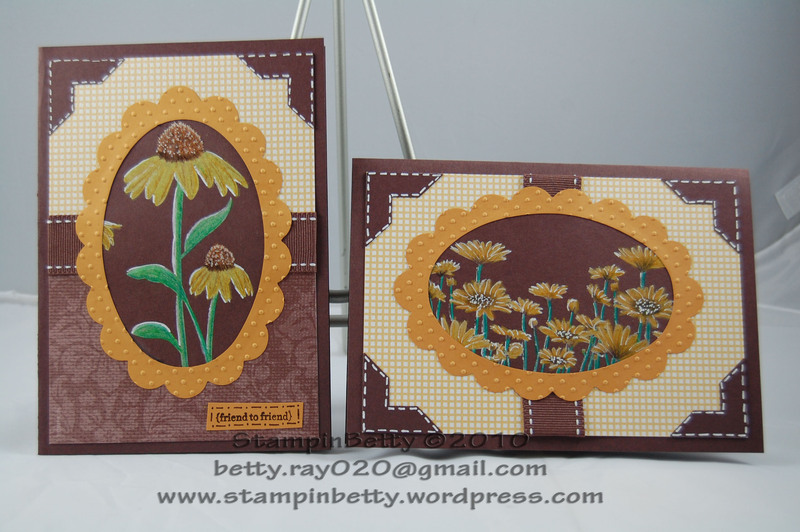 Hope my blog is inspiring you to keep on Stampin! 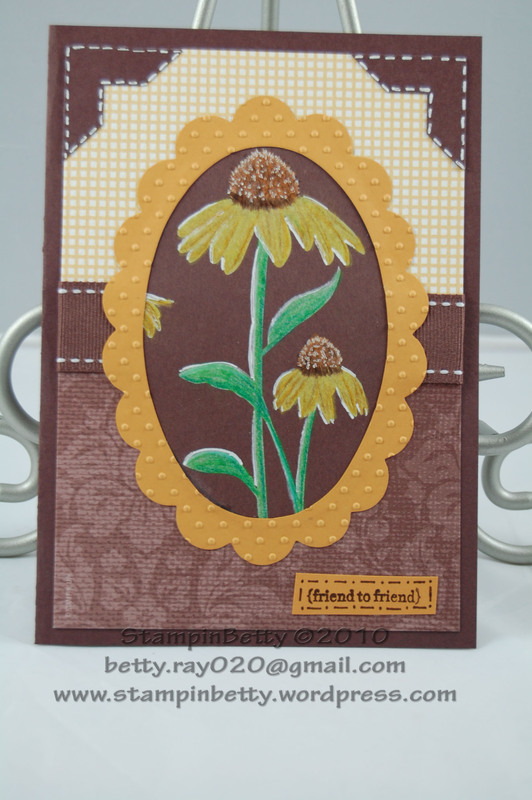 To support my efforts please shop my Stampin’ UP! shop for all your Stampin’ UP! supplies..